Suitable for low-cost, high-volume applications where space is critical. 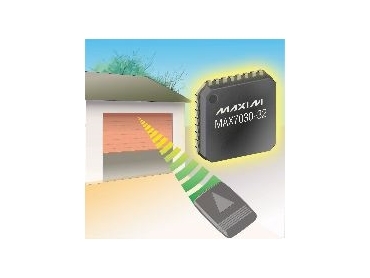 MAXIM Integrated Products, represented in Australia by Arrow Electronics , has released the MAX7030, MAX7031 and MAX7032 crystal-referenced VHF/UHF transceivers. They deliver more than +10dBm output power and -114dBm (MAX7030/MAX7032 in ASK mode)/-110dBm (MAX7031/MAX7030 in FSK mode) sensitivity. The transceivers are housed in a 5mm x 5mm, 32-pin TQFN package suitable for low-cost, high-volume applications where space is critical. Typical applications include two-way key fobs, security products, garage door openers and remote sensors operating in the 300MHz to 450MHz band. The MAX7030 transmits and receives OOK/ASK data at a factory-set frequency in the 300MHz to 450MHz band with a data rate up to 66kbps NRZ, typical output power of +10dBm into a 50Ω load, and a typical receive sensitivity of -114dBm. It has separate transmit (PAOUT) and receive (LNAIN) pins. An internal RF switch can be used to connect these transmit and receive pins to a common antenna. The MAX7030 integrates a fractional-N PLL in its transmitter, and a fixed-N PLL in its receiver. This hybrid architecture eliminates the need for separate transmit-and-receive crystal reference oscillators, because the fractional-N PLL allows the transmit frequency to be set close to the receive frequency with high precision. The MAX7030's on-chip, 16-bit, fractional-N PLL allows frequency multiplication of the low-frequency crystal to frequency steps of f(crystal)/4096. Retaining the fixed-N PLL for the receiver avoids the higher current-drain requirements of a fractional-N PLL, keeping the receiver current drain as low as possible. The MAX7030 has a small number of discrete components. With all VCO and PLL parts on chip, the only key discrete components needed are a crystal and a 10.7MHz IF filter. The baseband data-filter bandwidth can be set with two external capacitors. ASK data of up to 66kbps NRZ can be transmitted/received after 250μs from the enable command. The MAX7031 transmits/receives FSK data at a factory-set frequency in the 300MHz to 450MHz band with a factory-set frequency deviation. The MAX7031 has the same data rate and typical output power as the MAX7030, but its typical receive sensitivity is -110dBm. The MAX7032 not only transmits/receives FSK data, but also OOK/ASK data in the 300MHz to 450MHz band with the same typical output power of +10dBm into a 50Ω load. It has a typical receive sensitivity of -114dBm (ASK)/-110dBm (FSK). The fractional-N architecture of the MAX7032 transmit PLL allows the transmit FSK signal to be programmed for exact frequency deviations. The problems associated with oscillator-pulling FSK signal generation are completely eliminated. The MAX7032 is programmed through a three-wire SPI bus. ASK or FSK data of up to 66kbps NRZ can be transmitted/received after 250 microseconds from the enable command. The MAX7030/MAX7031/MAX7032 draw less than 7mA in receive mode, and less than 13mA in CW transmit mode. All three devices operate over the automotive temperature range from -40°C to 125°C.